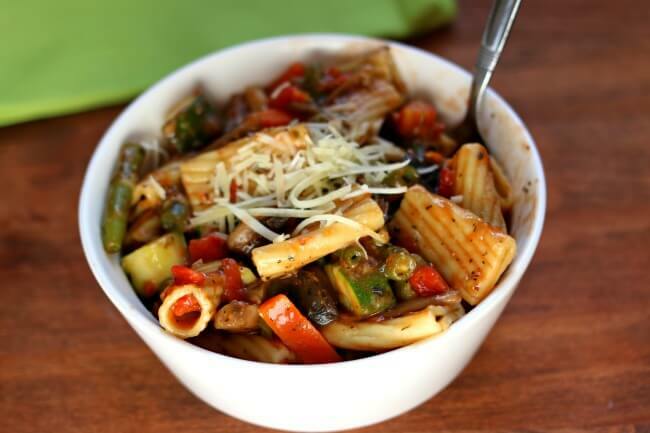 Instant Pot Pasta Primavera–A meatless pasta and vegetable dish. 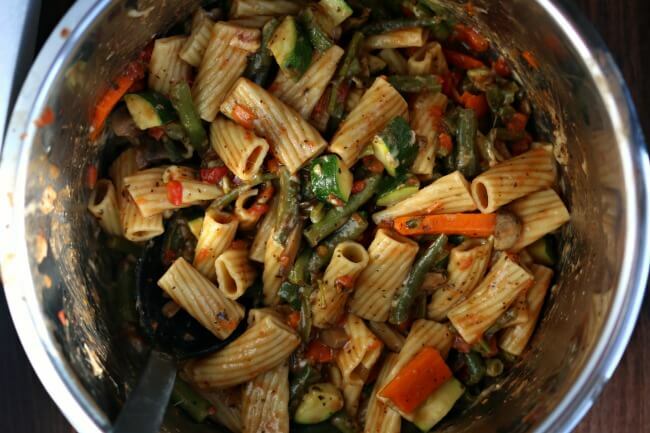 Rigatoni pasta is cooked quickly in your pressure cooker along with tomatoes, fresh green beans, carrots, mushrooms, garlic and zucchini. The whole dish is tossed with grated parmesan cheese. I have a raggedy folder that has some typed up pages of recipes. These recipes were brought to college with me many years ago. 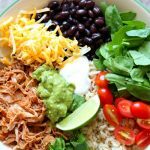 These were some easy dishes that I enjoyed and thought I would be able to prepare easily after classes in the evenings. 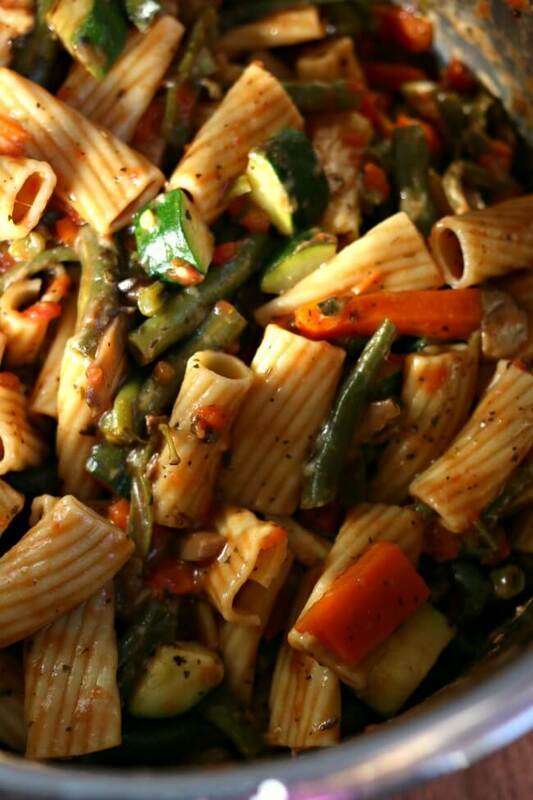 One of the recipes is pasta primavera. My mom would make this meatless pasta dish at home and I always loved it so much. It was full of veggies and pretty simple to put together. I remember one Sunday I invited a bunch of guys over for dinner and I’m sure they were expecting pot roast and potatoes but I prepared this pasta primavera instead. They were probably wishing they went to the cafeteria instead. Haha! 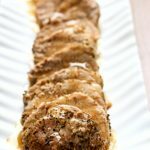 I haven’t made this dish in many years but for some reason I remembered it and thought how great it would be as an Instant Pot recipe. A true one pot dish. The original recipe called for canned green beans but switching them out with fresh green beans was a perfect choice. I chose to keep the canned tomatoes because if tomatoes aren’t in season then canned tomatoes are usually a better bet since they are canned at the peak of freshness. I used dried basil but fresh basil or basil from the squeeze tube would be amazing. 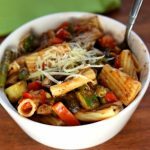 I think you’ll really love this Instant Pot pasta primavera! 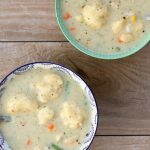 Try it out for meatless Monday next week. For Instant Pot pasta primavera I used my 6 quart Instant Pot Duo 60 7 in 1*. 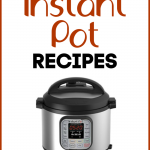 I love this Instant Pot because it has the yogurt making function which I use almost weekly. It has two pressure settings (high and low), and there are also little slots in the handles so that you can rest the lid there instead of putting it down on your counter-top. A fresh meatless pasta dish. 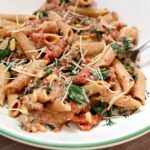 Rigatoni pasta is cooked quickly in your pressure cooker along with tomatoes, fresh green beans, carrots, mushrooms, garlic and zucchini. The whole dish is tossed with grated parmesan cheese. Pour the rigatoni on the bottom of the Instant Pot. Cover with the broth. Add in the garlic, carrot, mushrooms, green beans, diced tomatoes, salt, dried basil (if using fresh basil add it in later) and oregano. Don’t stir. Turn the Instant Pot to the saute function. Remove the lid and stir in the zucchini. In a small bowl turn the cornstarch and water together until smooth. Stir the cornstarch slurry into the pot. It will thicken up the sauce fairly quickly. Once the sauce is thickened turn the Instant Pot to the Keep Warm function. Stir in the parmesan cheese. If you are using fresh basil or basil from the tube add that in now. Salt and pepper the pasta dish to taste. I used kosher salt. Stir in balsamic vinegar, if desired. Spoon pasta onto plates and enjoy! 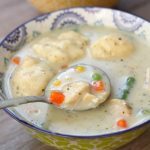 The original version of this recipe was made on the stovetop. Here are the instructions: (leave out the broth) Prepare rigatoni according to package directions. Drain. Saute carrots, beans and garlic in small amount of water over medium-low heat until carrots are tender-crisp (about 5 minutes). Stir in tomatoes, mushrooms, cornstarch, basil, oregano, salt. Cook, stirring constantly until sauce is thickened and translucent. Add zucchini and heat through. Add pasta to skillet; toss with cheese. It says garlic in the description, but not in the ingredients? I made this tonight and it was a bit bland. oops! I did forget to put that in the recipe. I added it in just now. Add in more seasonings to taste at the end next time. Sometimes that is all it takes for a bland dish to become amazing. Did you add in balsamic? Made this last night. The rigatoni took 5 mins to cook al dente. I did use 24 oz tomatoes instead of 14. There was no liquid to thicken, even with the extra tomatoes. I added romanesco zucchini at the beginning with the other veggies. I would make this again. Easy to collect veggies from the garden and prepare a satisfying meal quickly. I don’t think you should make it in the crockpot. It won’t work well. The pasta turns out weird. I did put the stove top directions in the recipe so you could do that if you’d like.